It’s the worst Press release I have ever read. OK, we can easily understand that their name is taken from the famous 80s movie "Ghostbusters". We also know that nowadays people in America prefer to watch "American Idol" and listen to all the new crap instead of listening to ZUUL’s album. Finally I don’t think that many people care about Mike’s favorite releases and the way they edited the cover for their album. Instead of all these there could be a few things about the past of this band or some other important information. So lets move on to the music part. I found this album pretty enjoyable. Nice songs, great melodies, a generally good voice. Most of the times they remind me of IRON MAIDEN, and stuff like that, but I like the classic Heavy Metal sound very much. 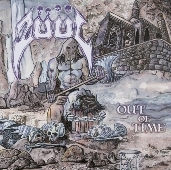 So I can say that I find "Out Of Time" a worth-listening-to album. I also have to mention that the production reminds me of the production of all the classic NWOBHM albums. You know…dirty enough to make you love it. I have to say that I like the cover of the album pretty much as well as their logo. If you like classic Heavy Metal bands and all this vintage stuff, give this album a try.